Looking for bourbon vanilla bean supplier in Madagascar? We are Bourbon Vanilla Bean Supplier in Madagascar. Contact us via our contact form. You will get full quote in less than 24 hours. What is bourbon vanilla bean ? We name Bourbon Vanilla Bean the black vanilla variety Planifolia fragrans, not split (NF). That is to say, Premium Quality called Gourmet Selection, simply the best of vanilla. The pods come from plantations located in Sambava in northern Madagascar, a city considered the world capital of vanilla. However, vanilla pods collected and prepared by a Cooperative of the Antalaha region, north-east of Madagascar. Concerning the quality, it varies according to their size and we offer here a rigorous selection of pods ranging from 15 to 20 centimeters. In addition, 100% culture without chemical fertilizers or pesticides according to the rules of organic farming. Unsplit black, flexible, fat and fleshy with a guaranteed vanillin content between 1.8% and 2.2% these vanilla pods develop a very beautiful chocolate scent. Humidity level of 35%. Average weight of a pod 15/16 cm: 3.5 grams. 17/18 cm: 4.5 grams. 19/20 cm premium: 7 grams. How do we process Bourbon Vanilla Bean ? We process Vanilla 100% Pure Origin Sambava, Madagascar, Southern Africa. 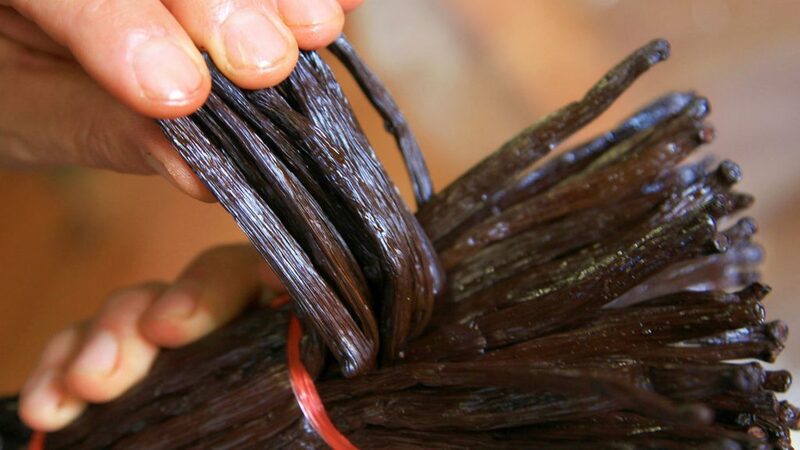 In order to obtain a richly aromatic spice, the cultivation and preparation of vanilla require long and careful care. Pollination consists of manually fertilizing, one by one, each of the orchid flowers that will later give the vanilla pod. This stage is spread over 3 months of flowering and pollination is carried out at this time every 3 days, at dawn, and with a simple wooden or bamboo stylus. Upon successful stage of fertilization, the fruit will take 6 full weeks to reach its adult size and it will take another 8 to 9 months for the pod to be harvested at full maturity. Find bourbon vanilla bean supplier madagascar. After harvest, the Bourbon Vanilla Bean method begins with scalding, which involves immersing the green pods in water at 65 ° C for about 3 minutes in wicker baskets. The pods are then transferred into large wooden boxes whose walls are covered with wool blankets to protect the vanilla and limit heat loss during the parboiling phase which lasts about twelve hours. It is this parboiling operation that gives the Madagascar vanilla its chocolate black color and characteristic fragrances. The pods are then sun-dried for several weeks, then in the shade for 2 more weeks before being calibrated according to their size and their colors, rather black, red-brown (TK vanilla) or red-red. (vanilla mostly used in North America). Labelled bourbn vanilla bean supplier. The transformation of perfectly odorless fruit into a smooth and pleasantly fragrant spice requires a long, careful and methodical preparation. Principles have been developed in Mexico for a long time and require a minimum of 6 months of effort. Description of a bourbon vanilla bean from Madagascar of so-called Extra Non Slotted (NF) quality. Whole pods not split, soft and healthy, good flavors, of dark brown or chocolate brown color. This may have some spots or ragues not exceeding one-third of the length. Maximum water content around 38% and minimum length of 14 centimeters. Import bourbon vanilla bean supplier from MadaMarket Export. AROMATIC NOTES: Powerful and persistent notes at the end of the mouth: crème fraiche, caramel, sugar, velvety sensation. The persistence in the mouth of the vanilla flavor is proof of the quality of the pod and its natural aromatic richness. PRESERVATION: Pods provided packed in a HERMETIC box. The assurance of the perfect conservation for years of taste and textural qualities of your pods. Be sure to keep the box at room temperature. INSTRUCTIONS from Bourbon Vanilla bean supplier : In infusion in liquids (milk, tea, coffee, rum, cognac, wine of oranges, etc …) The ideal is to split the pod in half with a knife, to graze the interior with a plucked to recover the pulp and the seeds. Always brew in the hot milk 60/80 ° at the beginning of the recipe to give the vanilla time to “give” its aromas. Whisk at half the time to dissolve the seeds of the pulp. DO NOT PUT THE PODS! after brewing, wash and dry the pods in the open air and place in a jam jar filled with cane sugar. RECIPES: Here are recipes of culinary blogs using vanilla pods.